Yes, absolutely. 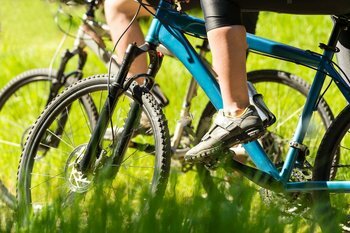 If you want to successfully and safely ride your mountain bike you need to use and wear the proper mtb shoes. There are many benefits these shoes provide which ordinary shoes do not. Riders who have never ridden a mountain bike or who have never ridden off road have no idea what it feels like to ride off road on a bike that is specifically designed for this purpose. When I was younger the only types of bikes I rode were road bikes. I had a Huffy Evel Knievel bike and then later I had a ten speed bike. I never thought I needed special shoes to ride any bike let alone a mountain bike. Some people think that unless you are a mtb bike racer it is not necessary to wear specially designed shoes when pedaling. But that is wrong, there are many advantages to using these shoes. The most important reason is grip or traction. When you are pedaling your feet need to stay on the pedals. In order for this to happen your shoes need to have traction so you can grip the pedals. If your shoes do not have a good grip on the pedals then your feet will slip off the pedals. This can cause you to lose speed and momentum. It could also cause you to crash and get hurt. You can also really scrape up your shins if your feet keep slipping off the pedals. If you are going downhill you really need to maintain your balance. One way of doing this is to keep your feet on your pedals. Plus if it is wet out or muddy, your pedals will become muddy and wet. To avoid sliding off and rolling down the mountain, you need shoes which have a grip. Along with a great grip for all types of weather, they are more comfortable, and they stay cleaner because of their front flap. Being comfortable allows you to focus on going forward faster, and not on feeling bad while pedaling. These types of shoes have a stiffer sole. This will help you to effectively and efficiently transfer power as you are pedaling your mountain bike. A flexible sole will not enable you to do this and power will be lost. You have to use more energy to get the same power. Stiffer soles also help you to conserve energy. There are only 2 types of mountain bike shoes. The first type is designed so that it can be worn and used on a flat bike pedal. The second type is designed so that it can be used with a clipless bike pedal. Weather resistant, and they dry faster than earlier models. This will help your feet to dry faster on longer bike rides if you run into wet terrain. Made with super-grip rubber, so you don’t slide off your pedals. This helps to maintain pedal stroke power instead of losing it when you need to adjust the position of your foot on the pedal. Stiff midsoles, which increase the power of your pedal strokes. This is important when you want to floor it and go faster. Four layer impact resistant foam, which gives more protection to your toes. Protects your toes from rocks and big roots on the trails. Internal bootie in the shoe for a more comfortable fit and increased control. Keeps you warm in the rain or in cold weather. Full shank between the insole and the outsole for pedaling efficiency. The lighter and stiffer it is the better the shoe will give you pedal power. If you are going to bike and hike then a less stiff shank is better to use. Speed lacing system so you can tie your shoes fast, which is protected by a Velcro flap. This keeps out dirt and water making it easier to keep clean. It also keeps your laces away from the bike chain and crank so they do not get tangled up. Vibram Megagrip, this is a sticky pedal contact area. The toe and heel area are less sticky but made from durable rubber so you can walk better off road. Many vents to keep your feet comfortable, plus there is an antibacterial insole for hot humid days to stop your feet from getting smelly. For increased stability and power there is a wider profile at the arch of the shoe. There is also a fast drying upper that gets rid of water quickly. There is a recessed space under the shoe where the cleats fit into. Then the cleats attache on to the pedal. This guarantees no slipping and increases pedaling efficiency and power. Your shoes are attached to the pedal, as you are pedaling you are able to pull the pedals upward. This increases your power and speed throughout the entire pedal stroke. This is particularly helpful when going up hill. Carbon sole, this type of sole is stiffer and therefore allows you to push down harder as you pedal. This gives you more power with each pedal stroke and it conserves energy once you get going. You are safer and more stable in this type of shoe. You do not have to worry about your foot slipping off and hitting the ground causing you to get hurt and or crash. You also don’t need to worry about having the pedal hit your shin after it spins around. Better control, because your shoes are attached to the pedals you will be able to maneuver and handle the bike better. This is especially important in a race, going through corners, over jumps, and downhill. If you are a beginner you should definitely use flat pedal shoes. You will be able to learn better and improve your skills with this type of shoe on a flat pedal. Flat pedal shoes are also good to start with because you will need to learn how to use clipless shoes. With flat pedal shoes you just get on your mountain bike and go. Clipless pedal shoes are necessary to use when you are racing because they give you a more efficient pedal stroke. This is true when the race is longer and the path is flatter. If the race is shorter and more downhill you can use flat pedal shoes. Going around corners and being able to use your leg as support is helpful. Plus you may save energy by pedaling and coasting a bit. I have seen a test done where using flat pedal shoes on the course was faster than using clipless pedals. But for longer races efficiency rules so go with clipless to conserve energy and win the race.